Epictetus (c. 55 C.E. – c. 135 C.E.) was a Greek Stoic philosopher who lived and taught in the Greek city of Nicopolis almost four hundred years after Zeno of Citium established the first Stoic school in Athens. His thought paralleled the teachings of the early Stoics, but he developed a new system for teaching his students to practice Stoicism in their daily lives. Stoicism deals with three major areas; logic, natural philosophy (physics), and ethics. Epictetus focused his teachings mostly on ethics. Epictetus himself apparently did not write, but one of his students, the historian Arrian, wrote two works, Enchiridion (Handbook) and the Discourses, based on notes that he made from his teacher’s lectures and interactions with students. Although four of the eight sections of Discourses seem to have been lost, these works lay out Epictetus’ teachings in careful detail. He believed the role of a Stoic teacher was to show his students how to strive for moral excellence and thus achieve eudaimonia (‘happiness’ or ‘flourishing’). This could be accomplished by taking responsibility for one’s actions and thoughts, and learning to accept fate with the right attitude. Epictetus also emphasized the role of destiny and divine providence in the lives of men. Epictetus differed from the early Stoics in that he emphasized that happiness could be found in maintaining one's moral character rather than in striving towards moral excellence. Discourses and the Handbook provide us with a detailed and complete explanation of Stoic ethics, which is not available in the preserved fragments of earlier Stoic works. The lessons set forth by Epictetus deal very profoundly with the human situation and with the difficulties encountered in everyday life. They continue to be relevant in today’s world. Epictetus was born in about 55 C.E. in Hierapolis in Phrygia (modern-day Pamukkale, in south-western Turkey). The name given by his parents, if one was given, is not known—the word epiktetos in Greek simply means "acquired." In his boyhood he came to Rome as a slave of Epaphroditus, a rich and powerful freedman who had been a slave himself and administrative secretary of the Emperor Nero. Epictetus was lame, and some accounts say that it was because of mistreatment by his master. While still a slave, Epictetus studied with the Stoic teacher Musonius Rufus. In about 89 C.E. the Emperor Domitian banished all philosophers from Rome. Epictetus went to Nicopolis in Epirus and opened a school there, which became well known and attracted many upper class Romans. Among his students was Flavius Arrian (c. 86-160) who composed the Discourses and the Handbook, and who later served in public office under the Emperor Hadrian. Arrian once remarked that Epictetus had been more popular in his day than had Plato in his. Epictetus lived a simple, frugal life devoted to teaching and philosophical pursuits. It is believed that he did not marry or have any children, although one story says that he married late in life in order to raise a child who otherwise would have been left to die. 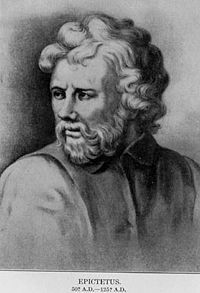 The Cynic philosopher Demonax, who was a pupil of Epictetus, once heard him exhort his students to marry and have children (for it was a philosopher's duty to provide a substitute ready for the time when they would die), and he sarcastically asked Epictetus whether he could marry one of his daughters. Epictetus’ main work is the Discourses, originally eight books, of which four remain in their entirety. A popular digest, entitled the Enchiridion—or "Handbook"—also survives. It is believed that these works were not written by Epictetus himself, but by his pupil Arrian. In a preface to the Discourses, addressed to Lucius Gellius, Arrian states that "whatever I heard him say I used to write down, word for word, as best I could, endeavoring to preserve it as a memorial, for my own future use, of his way of thinking and the frankness of his speech." Epictetus concentrated on teaching his students how to lead an ideal Stoic life. His teachings on logic, natural philosophy and ethics did not vary greatly from the original ideas set out almost four hundred years earlier by Zeno of Citium and Chrysippus, the founders of the Stoic school, but Epictetus developed a new system for teaching the practice of Stoicism. Like all the Hellenistic philosophers, he regarded moral philosophy as a means of teaching people to lead better lives and achieve eudaimonia ('happiness' or 'a flourishing life'). For the Stoics this meant a life motivated by virtue. To this end, Epictetus identified three topoi (topics) on which a Stoic should focus in order to achieve happiness. The first, Discipline of Desire, was an examination of desire, and the realization that a truly rational being only desires goodness, virtue, and actions motivated by virtue. A person who limits his desire to virtue can never be thwarted, disappointed or discouraged. The second topic, Discipline of Action, involved performing the actions appropriate to one’s position in the family, society and world, in order to fulfill the role of a rational, sociable being. Our actions, said Epictetus, should be motivated by the specific obligations that we have in virtue of who we are, our natural relations to others, and what roles we have adopted in our dealings with the wider community. We should not perform actions that are destructive or damaging to these roles; in other words we should not act carelessly or give way to impulses of violence, anger or jealousy. The third topic, Discipline of Assent, involved learning to evaluate a situation before reacting to it, and choosing an appropriate response. The Stoics taught that in every situation we receive an initial “impression” of what is happening around us, and that we must then apply judgment and interpretation to truly understand its meaning. Epictetus emphasized that we must first understand a circumstance before we can judge whether it is desirable or not and decide on an appropriate action. Epictetus emphasized that there are two types of circumstances; those that we have the power to change and those that are not in our power to change. We have the power to change our attitude and our actions in response to a situation, but we may not have the power to change the events themselves. Epictetus taught that a person should only be concerned with the things that he had the power to change. In order to achieve eudaimonia, or happiness, a person must learn to accept fate. Epictetus held the orthodox Stoic view that everything in the universe is directed by divine will, and made frequent references to the gods and Zeus in his discourses. He frequently exhorted his students to “live according to nature” meaning that they should strive to live according to divine will, and accept fate as having been ordained by god. While the early Stoics spoke a great deal about striving for excellence, Epictetus emphasized self-knowledge and keeping one’s moral character in order as the way to achieve a happy life. He instructed his students to expect persecution, because their actions and their attitudes would be so different from those of the people around them; they would appear aloof and unaffected by the passions and turbulent emotions that affected the general public. Epictetus encouraged his students to view life as an athletic challenge, a festival, or a stint of military service, where success would come through a combination of making correct choices and becoming skillful. "When I see a man anxious, I say, What does this man want? If he did not want some thing which is not in his power, how could he be anxious?" (Discourses 2.13.1, trans. Long). Epictetus, Nicholas P. White (trans. ), The Handbook, ISBN 0915145693, 1983. Epictetus, George Long (trans. ), Enchiridion, ISBN 0879757035, 1955. Adolf Friedrich Bonhoffer, William O. Stephens, The Ethics of the Stoic Epictetus, ISBN 0820451398, 2000. A. A. Long, Epictetus: A Stoic and Socratic Guide to Life, ISBN 0199245568, 2002. Epictetus, The Discourses (The Handbook, Fragments), Everyman Edition, Edited by Christopher Gill, ISBN 0460873121, 2003. Robert Dobbin, Epictetus Discourses: Book 1 (Clarendon Later Ancient Philosophers), Oxford: Clarendon Press, ISBN 0198236646, 1998. Epictetus: The Discourses, trans. W.A. Oldfather. 2 vols. (Loeb Classical Library edition.) Cambridge, MA: Harvard University Press, 1925 & 1928. ISBN 0674991451 and ISBN 0674992407. This page was last modified on 21 August 2017, at 16:04.